A&B Home Jolette 4-Light Wood Chandelier 4, 19" x 33.5"
Product prices and availability are accurate as of 2019-04-14 05:41:06 EDT and are subject to change. Any price and availability information displayed on http://www.amazon.com/ at the time of purchase will apply to the purchase of this product. 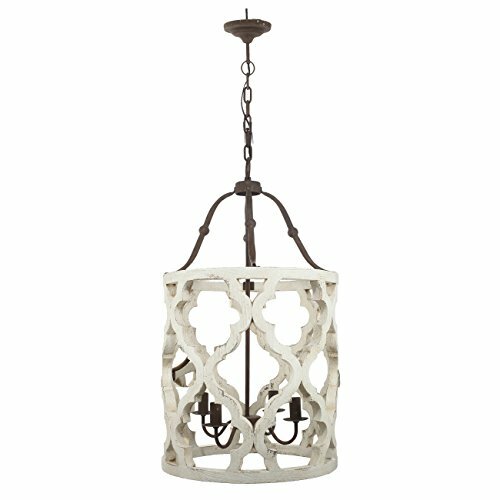 The Joliette 4-Light Chandelier has an open cylindrical wood covering that has a traditional French country motif. The distressed white finish makes this vintage-style piece suitable in many contemporary decors that mix-and-match inspiration. Specifications: Bulb Size: E12, Total Number of Bulbs: 4 Bulbs (not included), UL Approval, Max Wattage: 60W, Material: Fir Wood and Iron, Ceiling Chain Length: 72".